I love animal symbolism. I've always been fascinated with the link we make connecting ourselves to the traits, abilities, and characteristics of animals. As for eagles, the eagle has been a symbol of power and strength for thousands of years. Eagles are known for their sharp vision, a keen sense of perception, powers of intuition, Eagles represent action, resolve, and grace. Eagles figure prominently in the mythology of nearly every Native American tribe. In most Native cultures, eagles are considered medicine birds with impressive magical powers, and play a major role in the religious ceremonies of many tribes. Native American Indians saw the Eagle as a symbol for great strength, leadership and vision. Bald Eagles are a sacred bird in most Native American cultures, and its feathers, like those of the Golden Eagle, are central to many religious and spiritual customs among Native Americans. On the overall, eagles are considered spiritual messengers between gods and humans by most Native American cultures. Some Native American cultures represent the eagle with the "thunderbird." The "thunderbird" was a mythical super eagle responsible for creating thunder and lightning by beating its wings. Some believed that its feathers carry prayers to the sun. Eagle totems appear to inspire us to reach higher and become more than we think we are capable of. The "thunderbird" symbol is atop traditional totem poles of the Pacific Northwest Coast in Alaska, Oregon and Washington, and in British Columbia. In the sacred circles of wisdom among these Northwest coastal tribes, the "thunderbird" is said to be perched regally atop totem poles to denote ultimate status of an emblem of power. The 'thunderbird" is said to be the supreme chief among the Native pantheon of natural spirit energies. Totem poles are traditionally made from the cedar tree, as the cedar tree is considered sacred to the "thunderbird." For the tribes of the Northwest, legend states the "thunderbird" dwells in regal solitude in mystic cedar forests where no human is allowed. Believe it or not, the Northwest tribes' legend also says the "thunderbird" smokes tobacco from cedar pipes. Yes, we have to remember that legends are just legends. In some Northwest Coast tribes, the floor used to be dusted with eagle down at potlatches and other ceremonies as a symbol of peace and hospitality. In the mythology of some tribes, the eagle plays a leadership role either as king of the birds, or as a chief who humans interact with. In other legends, the eagle serves as a messenger between humans and the Creator. Many pow wow dancers use the eagle claw as part of their regalia as well. Eagle feathers are often used in traditional ceremonies, particularly in the construction of regalia worn and as a part of fans, bustles and head dresses. The golden eagle, also known as the "war eagle," is particularly associated with warriors and courage in battle, and it is golden eagle feathers that were earned by Plains Indian men as war honors and worn in their feather headdresses. In some tribes, this practice continues to this day, and eagle feathers are still given to soldiers returning from war or people who have achieved a great accomplishment. As for the Native American Indian "warbonnet" headdress -- full eagle-feather warbonnet like that worn by the Lakota Sioux or Cheyenne? Believe it or not, from what I've read, most American Indian tribes never used eagle feather headdresses. 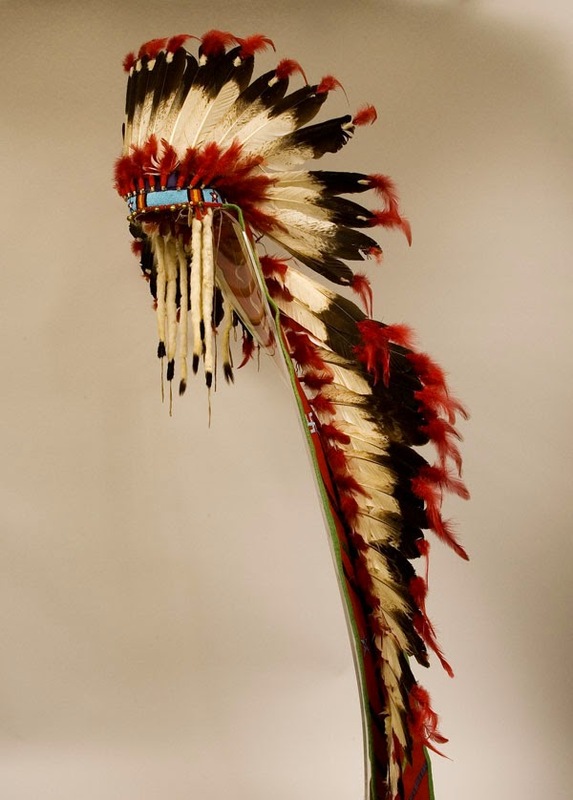 Feathered warbonnets may be the best-known American Indian headdresses, but they were not the most commonly used. As far as taboos, because the Bald Eagle and the Golden Eagle are considered such a powerful medicine animal, the hunting or killing of eagles was restricted by many taboos. Eating eagle meat was forbidden in many tribes. It is said that in some legends, a person who eats eagle meat is transformed into a monster. In Southeastern tribes, only men with special eagle medicine, known as Eagle-Killers were permitted to kill eagles. In the Cherokee tribe, even Eagle-Killers were only permitted to kill eagles during wintertime. In some Plains Indian tribes, feathers were required to be plucked from a live eagle so as to avoid killing them. To accomplish this, eagles were trapped in a net and released. The Lakota give an eagle feather as a symbol of honor to someone who achieves a task. In modern times, it may be given on an event such as a graduation from college. The Choctaw considered the Bald Eagle, who has direct contact with the upper world of the sun, as a symbol of peace. The eagle plays a crucial role in the sun dance of the Plains Indians, and symbolizes the sun in the rites of some of the Southwestern tribes. The Iroquois tell of Keneu, the golden eagle, and of Oshadagea, the giant eagle with a lake of dew on his back who lives in the western sky. The Pawnee believed eagles to be a symbol of fertility because they build large nests high off the ground and valiantly protect their young. They honored the eagle with songs, chants, and dance. The Pueblo Indians associated the eagle with the energies of the sun, both physical and spiritual, as well as symbols of greater sight and perception. The Zunis carve stone eagle fetishes for protection, ascribing to them both healing and hunting powers, and the Eagle Dance is one of the most important traditional dances held by the Hopi and other Pueblo tribes. The Navajo Indians have a myth that says eagles originated when a warrior, Nayenezgani, slayed a monster who lived at Wing Rock. Afterwards, he turned to the beast's offspring, who were now alone in their nest. Rather than have them grow up evil, he turned the youngest into an owl and the oldest into an eagle, who would be a source for feathers for rites and bones for whistles. Eagles are also one of the most widespread clan animals used by Native American cultures. Tribes with Eagle Clans include the Chippewa whose Bald Eagle Clan and its totem are called Migizi, while the Golden Eagle Clan is called Giniw, the Hopi whose Eagle Clan is called Kwaangyam or Qua-wungwa, the Zuni whose Eagle Clan name is K'yak'yali-kwe, and other Pueblo tribes of New Mexico, Plains tribes like the Caddo and Osage, and Northwest Coast tribes like the Haida, Kwakiutl, Tsimshian, and Tlingit. The eagle was an important Clan crest on the Northwest Coast, and eagle designs can often be found carved on totem poles, ceremonial staffs, and other traditional Northwestern art. And many eastern tribes, such as the Cherokee, also have an Eagle Dance among their tribal dance traditions. 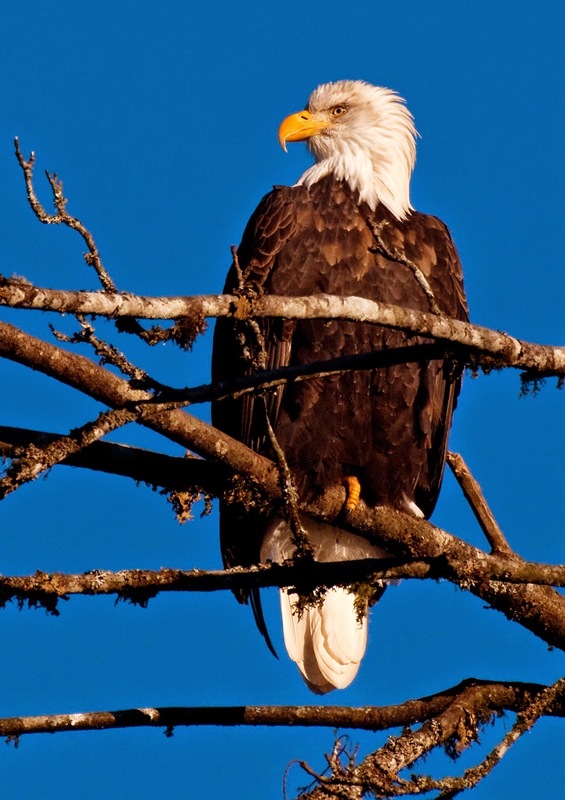 While eagle legends vary from tribe to tribe throughout the United States and Canada, most Native American legends agree that when an eagle appears to you, it means that you are being put on notice. The sight of an eagle is said to be telling us to be courageous, and to dream of a flying eagle or one who is perched high signifies good fortune or victory coming your way. It is also said that if it scares you or attacks you, it means there are some self-imposed limitations you need to get through. But please, don't think the Native Americans had a corner on how humans perceive eagles. Across our Southern border, among the ancient Aztec, legend says how during the creation of the present world, the eagle and the jaguar fought over who would have the honor of becoming the sun. The Aztecs say the eagle settled the matter by flying into a fire and becoming the sun. The jaguar, following close behind, settled for becoming the moon, with the spots on his coat showing that he had been only partially burned. The Aztecs also believed that their chief god told people to settle at a place where they found an eagle perched on a cactus eating a snake. Legend says that place is Mexico City. And yes, the eagle has been used as a "banner" by many of the great empires throughout history, from Babylon to Egypt, through to Rome and even the United States. Believe it or not, in early Christianity, the eagle was seen as a symbol of hope and strength, representing salvation. The eagle appears twice in the book of Revelation, both times in a context that suggests it is on the side of God. Not surprisingly, for Muslims, eagles represent war and ferocity and dominance. Long before mohammed who died around 632 AD, and even longer than before the birth of Christ, the eagle was a strong emblem in the Roman Empire. Besides believing in human sacrifice, among other things, eagles were once revered as a symbol of wisdom and power by the ancient Druids in Ireland. For the Norse, legend has it that the eagle is associated with their god Odin because of its wisdom and light. It may not be coincidence that such different cultures across thousands of years have adopted the same symbol. For those fighting for freedom, the Eagle's ability to fly high to the tops of mountains and silently into valleys, makes it associated to a free spirit. The Bald Eagle is the national bird of the United States of America. On June 20, 1782, the Continental Congress adopted the still-current design for the Great Seal of the United States including a bald eagle grasping 13 arrows and a 13-leaf olive branch with its talons. The Bald Eagle appears on most official seals of the U.S. government, including the presidential seal, the presidential flag, and in the logos of many U.S. federal agencies. 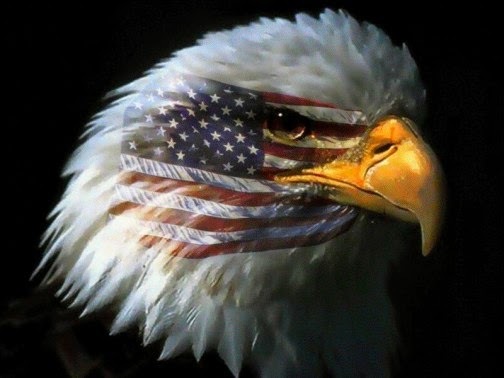 During the days following the cowardice Muslim attack on 9/11/2001, the American Bald Eagle played a role in uniting our nation with the circulation of pictures like these seen here. While I have read the popular legend, supposedly there is no evidence that Benjamin Franklin ever publicly supported the wild turkey rather than the Bald Eagle as a symbol of the United States. While many might not realize it, Golden Eagles typically have larger bodies and shorter wingspans compared to Bald Eagles. As most of us know, adult Bald Eagles are easily identified by their brilliant white heads and tail feathers and black bodies and wings. They have black talons and yellow eyes, beaks and feet. 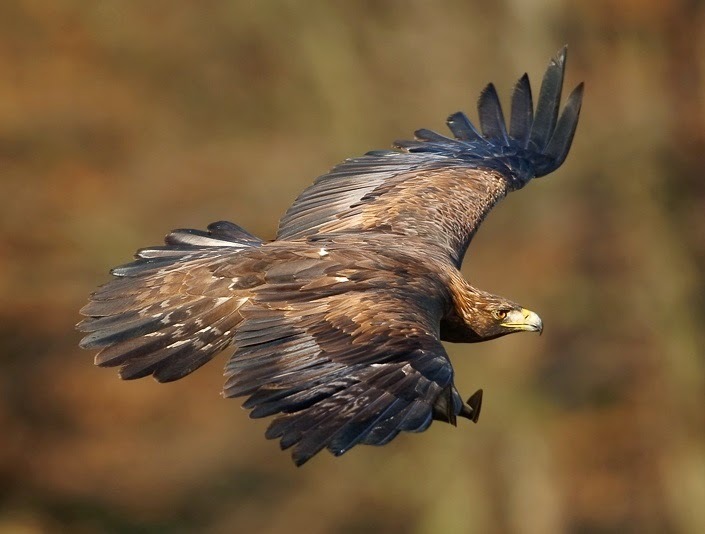 In contrast, Golden Eagles have shorter, darker bills and dark feathers with a pale golden cast in the area around the neck. Some confuse Golden Eagles for young Bald Eagles because young Bald Eagles do not obtain their adult colors until they are about five years old. An eagle's eyes are up to eight times sharper than that of humans and are much more more color-sensitive. Located on the side of the head, their eyes provide a wide field of view. Bald eagles have large wings compared to other birds, allowing them to soar and hunt vast areas with a minimum of effort. During migration they can travel 400 to 500 miles a day. Bald Eagles have large, sharp talons and strong feet which they use to catch their prey. All of these traits can be viewed symbolically as ideas to assist humans to be more successful within their own lives. Even with the eagle's magnificent ability to fly, it stays connected to the earth. So how far back in man's history can we trace the idea that we must keep ourselves grounded and lay a solid foundation for ourselves? The talons - meant to grasp and hunt - reflect the need to utilize the things of the earth but also have been the symbol of power and strength. It appears eagles have represented power far longer than we suspect. 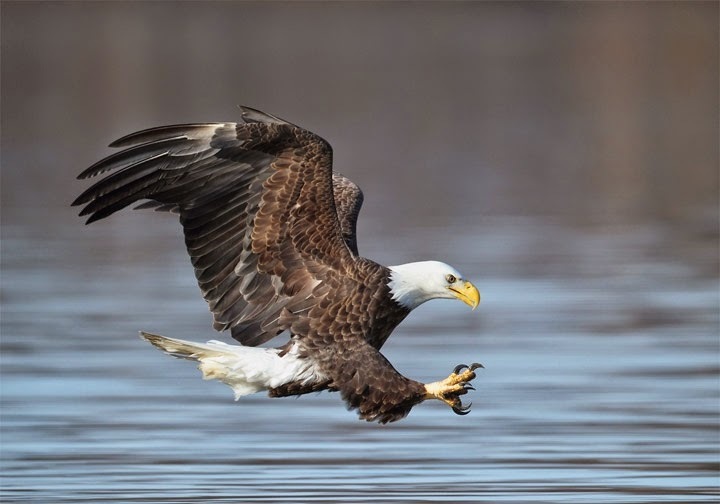 A recent report speaks to the connection mankind has with eagles. On March 14th, 2015, it was reported that Neanderthals wore eagle talons as jewelry 130,000 years ago. The eight eagle talons from Krapina arranged with an eagle phalanx that was also found at the site. Long before they shared the landscape with modern humans, Neanderthals in Europe wore eagle talons. Researchers identified eight talons from white-tailed eagles -- including four that had distinct notches and cut marks -- from a 130,000-year-old Neanderthal cave in Croatia. They suspect the claws were once strung together as part of a necklace or bracelet. The talons were first excavated more than 100 years ago at a famous sandstone rock-shelter site called Krapina in Croatia. There, archaeologists found more than 900 Neanderthal bones dating back to a relatively warm, interglacial period about 120,000 to 130,000 years ago. They also found Mousterian stone tools, a sign of Neanderthal occupation, a hearth and the bones of rhinos and cave bears, but no signs of modern human occupation. The talons had been studied a few times before, but no one noticed the cut marks until last year when the curator of the Croatian Natural History Museum was reassessing some of the Krapina objects in the collection. Now extinct, Neanderthals were the closest known relatives of modern humans. They lived in Eurasia from about 200,000 to 30,000 years ago. Recent research has uncovered evidence that Neanderthals may have engaged in some familiar behaviors, such as burying their dead, adorning themselves with feathers, and even making art and jewelry. While the report said that scientists debate the extent to which Neanderthals were capable of abstract thinking, their ability to deliberately make and wear jewelry suggest that they could be wrong. Did the Neanderthals connect with the eagles spiritually like say the Native Americans or other cultures did in later? Did they use their talons as a sign of status in their clans or tribes? Did others see a wearer of eagle talons as someone in the same vain as an Indian warrior? No one knows the answers to those questions. And of course if this find is simply about talons being used as an adornment, this is still significant because it's more proof of how long humans have tried to associate themselves with eagles for one reason or another.